Land, take off and do crazy stunts with 1-button ease Fly this camera drone just by tilting your phone Program a custom route on the drone iPhone or Android app and cruise handsfree Capture it all in crystal-clear 720p HD with one of the most feature-packed drones with HD camera! PILOT IN FPV W/ A WI-FI CAMERA DRONE THAT MAKES FLYING FUN. The Thunderbolt drone with camera is so easy to fly it rivals all other drones for kids, yet its 720p HD camera and crazy flip-stunt capability makes it a pro favorite, too. GET SUPER STABILITY W/ A 6-AXIS GYRO, HEADLESS MODE, ALTITUDE HOLD & MORE. More gyros combined with Headless Mode and Altitude Hold means you can flip, fly and have fun, all while getting better imagery than with other drones with HD camera features. FLY THIS RTF DRONE W/ 1-KEY CONTROL RIGHT OUT OF THE BOX. This RC quadcopter is RTF - ready to fly. And, with features like 1-button takeoff, landing and 360° flips you'll be piloting like a master in no time. BARNSTORM LONGER W/ EVEN MORE BONUS BATTERIES. 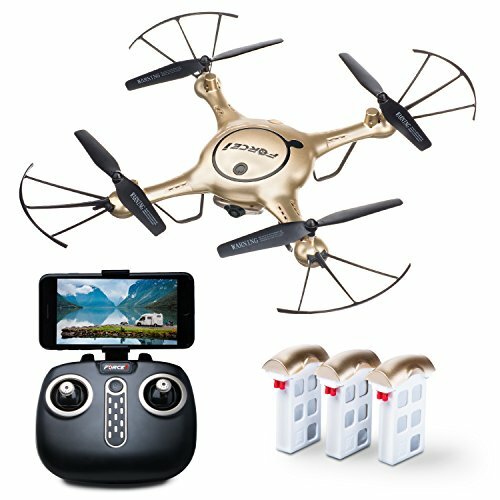 You get a total of 3 batteries with this camera drone so you can enjoy more airtime between charges. CREATE CUSTOM ROUTES W/ THE FLICK OF A FINGER. Trace a route on your phone and watch your Thunderbolt camera drone fly unassisted - all in real-time FPV. Take control of the Thunderbolt quadcopter drone with camera and harness the power of Zeus in the palm of your hand!